Under the Manage Users tab, you can view and edit the settings of all the users on your team. 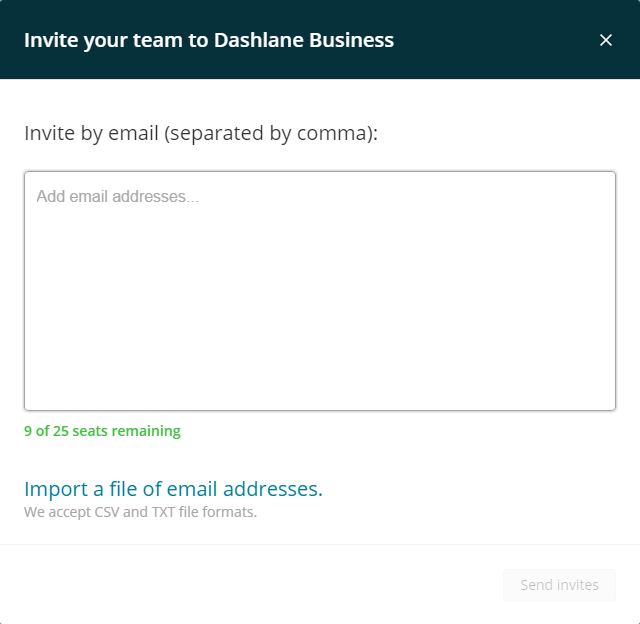 To have a clearer view of the activity of your team, Dashlane Business enables you to see how many invited members of your team have already joined your account. Want to add more team members? Just click on Add users and a pop-up will appear. To learn more, read: How to invite members to your Business account? Another way to invite users to join your Business account is by adding Dashlane as an application to your Identity Provider. To learn more about integrating Dashlane with SAML 2.0 please click here. In this area of the Admin Console, you can monitor each member on your account, including their security score, last login, and their admin rights. With the search bar, you can quickly find a member of your team at any time. Also, you can use the filters to sort through members by: Active users, Pending invites or Revoked Users. Note that your company's Security Score is solely based on passwords added to your Business Space, and not on passwords added to Personal Spaces. More information on that here. Members can only access and share the passwords that other users share with them, but cannot add or remove other members to the account via the Admin Console. Admins have the same rights as members, but will also have the ability to add or remove other members to the account, change members to admin, and manage billing information. A billing contact can also edit the account's payment information via the My Account tab of the Admin Console. A billing contact cannot add or remove other members to the account without admin rights. There can only be one billing contact per Dashlane Business account. We highly recommend setting at least two users as admins, just in case one admin leaves the company. A Dashlane Business account can have an unlimited number of admins. To edit the billing contact, go to the My Account tab and click on Edit next to Billing contact. If your invite is still pending, you can resend it by hovering on the contact email, clicking Edit, then selecting Resend invite. If the user already accepted the invite, you will see their last update time in Last Login column. If you are an admin, you can revoke team members from your Dashlane Business account at any time. To do so, hover over the member's email address, then click Edit. Next a pop-up box will appear, from which you can simply select Revoke member. If the member had already joined your Business account, he will still show on the list once revoked as a greyed-out user. This allows you to quickly reactivate this user should you one day need him back on your account. If the user still had a pending invitation to join your Business account, he will completely disappear from the list once revoked. If the user still had a pending invitation to join your Business account but had clicked on the email link to join your account, he will be considered as a member and behave like one once revoked. Users that were revoked and show as greyed-out users on the Manage Users Tab can be quickly reactivated by clicking on Edit then Reactivate. For a member to change their profile picture on Dashlane Business, they will need to go on Gravatar, go to the Manage Gravatars page, add their email account connected to Dashlane Business, and then select the picture they would like to appear on their account.